Bakers, butchers, green grocers, florist and more – you can find everything to buy there in the turbulent Cambodian markets which are just a little bit different than in many other countries. Anyone traveling to Cambodia, will quickly feel the hustle and bustle everywhere. As in other places in Asia the markets are attractive with lots of products that differ from those in other parts of the world. 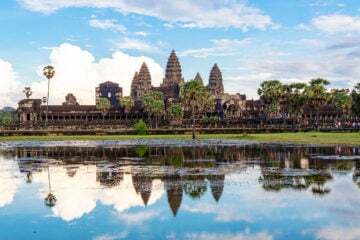 The case is more or less the same in Siem Reap – the town in the south of the temple complex of Angkor. This is a typical tourist market with goods and services tailor made to suit tourists, Here,mostly tourists will afford the prices that are a bit high but still it is exciting to go to the markets where local people shop. André Ruys, an entrepreneur and of dutch nationality with local knowledge offered to give us a tour of the market and it soon became clear that this was no comparison to the markets in the city center. Even some bargain goods didn’t stir our appetite; like these roasted insects, for example. Also meat is served to us in unusual ways. A fridge is nowhere in sight with temperatures outside around 35 degrees! It is hard to believe that even cooks from the surrounding hotels buy these kind of meat here, but it is definitely fresh. But then we were totally convinced! Our opinion: Absolutely delicious and recommendable! At Clemens bicycle’s saddle was broken and we needed a repair shop. Seiyon had to communicate in the local language-Khmer for a workshop hoping we could find one quickly. Having explained our concern and negotiated the price, he immediately started the work of repairing. Meanwhile, the son of the mechanic was copying his father and used the hammer for different things. Only that he was hammering a straw instead! The Pshar Leu Market is the largest market in Siem Reap. Here we were taken by Christophe on a journey into the unknown. Each week he was there once, he told us that there is always something new to discover. He was right! After every three meters we had to press the shutter of our camera for pictures. On the Pshar Leu Market you can get the most delicious breakfast. We got noodles with vegetables, fried egg and wrapped in batter – What was that again? – Definitely delicious and we got a big smile from the boss to sum up a nice breakfast. Strong again we headed back on the road and stopped a few blocks away at a section of bakers. It smelled nice from all corners – sometimes accompanied by a slight sweet smell of fish of the nearby Fish stall. Everything looked really delicious and we could not decide which of the dishes we should try. And then Cristophe showed us something very old and beautiful – a machine for grinding the ice, you put a big cube in the middle, turn with the handle the wheel, and the blade underneath slices the ice. Of course, we could not resist a photo of this machine. We shot many more photos and were finally exhausted from so many impressions and experiences. After this we drove back to our guest house relaxing and talking about our experiences.